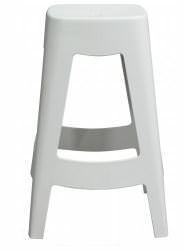 Does anyone know where I can get a cream colour bar stool like the below one? Have looked at Kmart, warehouse, Google but not body seems to have them. A house we just bought had cream ones in there from the staging company and looked perfect for where they are going to be placed. Kmart appear to have black ones. $29 cheap enough to buy some cream paint of your choice. "White" not cream - I'm not sure how "stark" white they'd be - you'd probably need to eyeball them. They are knock offs of "Tolix" chairs. I reckon a can or three of spray paint would give a better result than a brush. Bricoes have them in silver - called Loriet. Bought ours from Cintesi in Newton. They describe the "white" option as being a "creamy white". Not sure where you are located, but in Wellington (Seaview Lower hutt to be exact) is an importer called Zuca, they have a showroom during certain hours. We got the dining chair version from them. Really good “replica” bar stool products and I think free shipping in NZ.